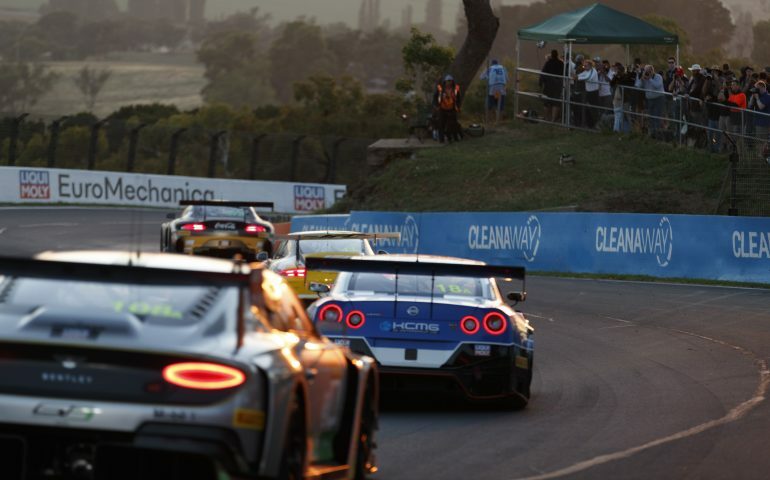 THE LIQUI-MOLY Bathurst 12 Hour is one of the most competitive races on the calendar – it’s also one of the most photogenic. Our chief snapper Mark Horsburgh captured some gold – sometimes, literally – across the twelve hours on Sunday. Here’s a few premium examples of his handywork. The field heads up Mountain straight on the opening of what would be 312 laps of the Mountain. The sun rises over the blue mountains as the field and crowd settle in for the long run. Golden light at the top of Mount Panorama early in the race. Layers on layers of colour looking out over the Central West. Stunning scenery at the top as the GT3 cars poke their way through their trees through the Sparesbox Dipper. The Porsche that would ultimately win the race climbs up the Audi Sport Cutting. Audi leads a pair of Bentleys, an AMG and a Porsche on the run through the Shannons Esses. Battle of the day? Perhaps. The BMW M6GT3 holds out attack after attack from the big no. 108 Bentley. Can you believe this is in the final 15 minutes of a 12-hour race? Matt Campbell sets up the pass on Raffaele Marciello that would see him grab second from the yellow Mercedes-AMG.